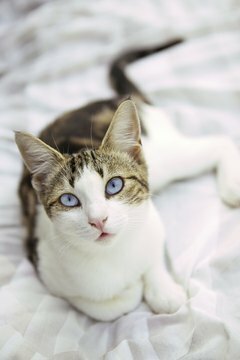 Can You Use Vitamin E Topically on Cats? Vitamin E can be used topically on our feline friends. You probably know that vitamin E is good for your skin and has multiple uses, but what about your cat's skin? While you should always consult an experienced veterinarian regarding the health and treatment of your pet, there are circumstances where applying topical vitamin E can help. One use of topical vitamin E involves ridding your cat of ear mites. If you know for sure your cat has ear mites and not an ear infection, vitamin E oil is the first step in eliminating them. This is because the oil makes them temporarily immobile. Soak a small amount into a cotton ball and clean your cat's ears with it. (Don't use cotton swabs because you could puncture the ear drum, especially if your cat is not still, which he is not likely to be.) Repeat this process until you have removed all debris from both ears, or until your cat forcibly persuades you to stop. Follow immediately with ear mite treatment. Another topical use of vitamin E in cats is to help ease the skin discomfort caused by mange. While vitamin E oil does not kill mange mites, it can help ease the itching they cause and the inflammation caused by scratching. Simply apply it to the affected areas of your kitty's skin. Vitamin E also can be used topically on cats who have flea allergy dermatitis. This is a condition in which the cat is allergic to flea saliva, so when they are bitten it is extra itchy. This, in turn, leads to extra scratching, sometimes to the point of causing the skin to bleed. Again, vitamin E oil does not solve the problem but can help treat the effects. Rubbing a few drops on the affected areas of an itchy kitty's skin every day can make him more comfortable and help his skin heal. Some poor kitties even can have skin reactions to the topical products applied to kill fleas. Vitamin E can be used topically in this case also. If irritation occurs only at the site where it was applied, the contents of a vitamin E capsule can be applied to help. What Is Line Brushing on Dogs? Can Vitamin D Cause Paralysis in Kittens?